I don't think eNom Central is a member here, so I'm going to give you my honest experience with them. I bought a domain from NameJet, rather than SnapNames. SnapNames normally send their domains to Network Solutions. I occasionally use NameJet, but their interface is really buggy and the UX is terrible. This screenshot, the search bar is covered up by a notification. They don't even put the company name in their email headers. You can see that there's no real way to search with the domain extension. I think everyone who searches for domains, searches with an extension in mind... just simply poorly thought out UX. Then, NameJet hands the terrible UX over to eNomCentral to finish it off. So you try to push the domain, it says "Unknown error" and you know that's just gonna make my blood boil even further. How descriptive! An unknown error! Their only real method of support is phone support and it's long distance, not a toll free number. They have a ticket system and a Twitter but neither seem to be actively monitored. What a garbage system. Back to SnapNames and Network Solutions! Update: The unknown error is because they put the domain in a 45 day lock, because it's "new." Great, so my deal is falling apart as I had this domain sold. Paid $69 for it, and had a buyer already send me $375 for it. Now I told him the news, and he wants nothing but a refund. 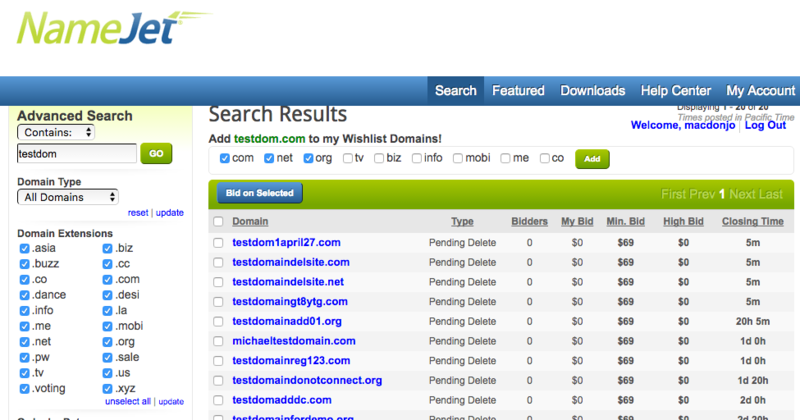 Bottom line: NameJet and eNomCentral costed me a $375 sale. The last time I'll use these jokers. Also, SnapNames doesn't do the 30 day hold. It leaves very little reason to stay with NameJet! I heared good things about namecheap and godaddy. You can try them.